The candidates for the Halifax riding sparred onstage once again yesterday evening, this time turning their attention to youth and student issues. 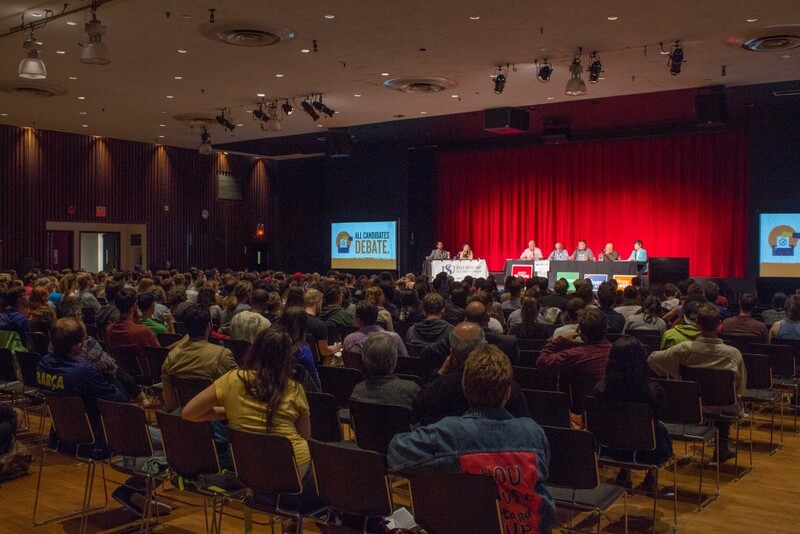 All five candidates were present to debate: Allan Bezanson of the Marxist-Leninist Party, Irvine Carvery of the Conservative Party, Andy Fillmore of the Liberal Party, Megan Leslie of the NDP and Thomas Trappenberg of the Green Party. 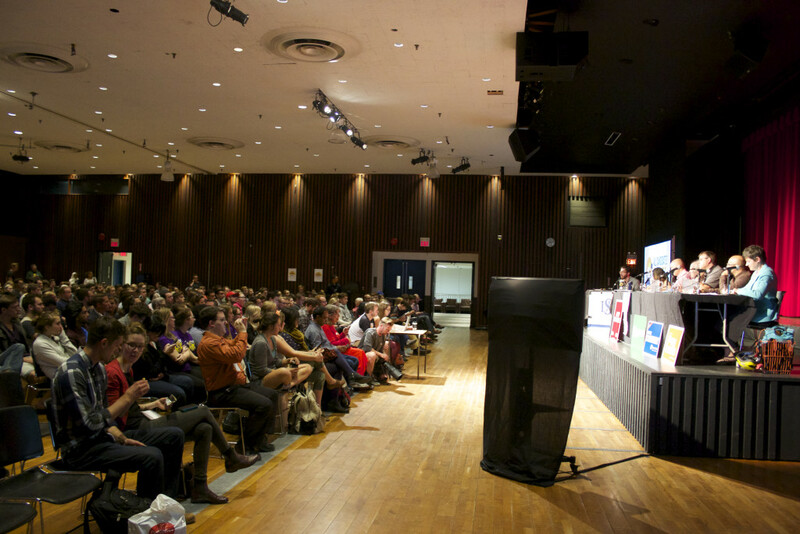 A crowd of hundreds filled the McInnes room in Dalhousie’s Student Union Building, providing the candidates with questions on topics ranging from gender-based violence to student debt and funding for scientific research. Over the course of two hours, the five candidates received pre-recorded video questions from students as well as questions collected from the audience. Dalhousie Student Union president Dan Nicholson and chairperson of Canadian Federation of Students – Nova Scotia, Michaela Sam, moderated the debate. Despite thick layers of policy and promises, the weeks of campaigning seemed to have brought some candidates closer together. While the five candidates bickered about most of the questions posed, each one shared their own experiences of the difficulties that come from being a student. Bezanson, Fillmore and Leslie were all Dal students, and all shared their experiences with student debt. Carvery shared his experiences being in the first class of Dal’s Transition Year Program. In response to a pre-recorded question about how each candidate’s party would help Nova Scotian students bear the average of $35,000 in student debt, Leslie recalled her own experience of leaving university with $80,000 in debt. Leslie also spoke about a term she spent in Finland, where students not only receive free education and free housing, but are also paid to attend university. Dalhousie professor and Green party candidate Thomas Trappenberg was born in Germany, and shared Leslie’s views of the flaws within the Canadian university system. “Here, education is treated as a business, and that is not acceptable. It is really a shame that here we do not value our youth,” he says. While Carvery does not advocate for free tuition for all students, he did emphasize the importance of accessible student loans. “Without the ability for students to have student loans, then university would be exclusively for rich people. The most important thing coming out of university is having a job,” he says. After much politicizing and sympathy, exercised through carefully chosen words and anecdotes, Bezanson shook up the panel and the audience with his input on student debt, which quickly translated into his stance on student life as a whole. “You’re gonna get a lot of promises. You’re gonna get them out of your ying yang in this election. It is inherent in the capitalist system that they are going to promise you the sky and not deliver on it. It is you that has to fight tooth and nail,” he says. After over two hours of sometimes-sly quips and artfully avoided questions, it was Trappenberg’s closing remark that seemed to resonate the most with the audience.